A COLOURFUL JOURNEY TO SUCCESS: FROM CHANGING TYRES TO SUPPORTING LOCAL CHARITIES TO DINNER WITH PRINCE CHARLES. Born into a large Sikh family in Delhi, with a very fortunate upbringing and deep instilled family values, Sethi grew up in Kuwait and studied in London. Before starting a computer business Vic worked for a few years fitting windscreens, changing tyres and selling car parts in Kuwait. This made him a stronger person in life and gave him the encouragement of standing back on his feet when they got invaded by Iraq in 1990 and had to leave to Delhi. 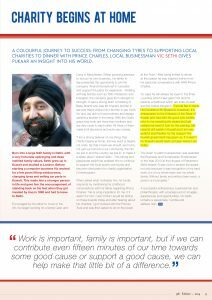 A COLOURFUL JOURNEY TO SUCCESS: FROM CHANGING TYRES TO SUPPORTING LOCAL CHARITIES TO DINNER WITH PRINCE CHARLES, LOCAL BUSINESSMAN VIC SETHI GIVES PUKAAR AN INSIGHT INTO HIS WORLD.Carry in Manchester. Whilst pursuing avenues to set-up his own business, his father-in-law presented the opportunity to join his company ‘Anand International’ in Leicester and support the plans for expansion. Working with big brands such as TDK, Panasonic and Energizer, the company grew from strength to strength. It was a strong team consisting of Babu Anand who was Mr Anand’s brother in law and Harjot Anand Vic’s brother in law. Both Vic and Jay did not have brothers and always wanted a brother in the family. With the God’s grace they both are more than brothers and are very close to each other. All three of them make joint decisions and work very closely. “I am a strong believer of one thing, that charity begins at home, the key word is begins not ends. By that I mean we should use home, not just our home but our community, the city we live in and the country we live in, to make it a better place” shared Sethi. This strong and passionate belief has enabled him to continue to support the local sports community and become chief patron for charity organisation Crimestoppers. PMat the Trust.” After being invited to dinner at the palace he was inspired further from his personal conversations with HRH Prince Charles. Vic says he will always be loyal to the three countries which have given him and his parents a livelihood which are India, Kuwait and the United Kingdom. “I would like to thank His Excellency Mr Khaled Al-Duwaisan, the ambassador to the Embassy of the State of Kuwait who had sent his good luck wishes prior to me receiving the award and had wished me best of luck for the evening. My parents still reside in Kuwait and I am very grateful and thankful for the support The Kuwaiti government has given us, if it wasn’t for Kuwait I would have not been where I am today.